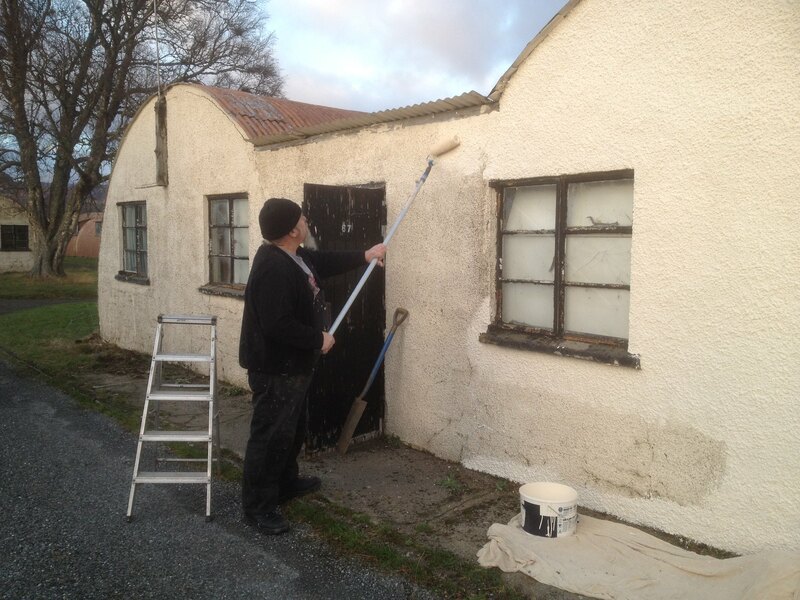 Enable local and community participation in the ownership of the land and buildings at Cultybraggan Camp. To encourage not for profit organisations, local businesses and private individuals to get involved with use, upkeep and refurbishment of the buildings. To increase activity at the camp. Improve the assets of the Village. Enhance the appearance of the camp. To make progress even if there there is no grant or loan funding available at the present time, and still to be able to inject these funds when they become available in future years. This aerial view illustrates the original huts allocated to the project. More huts have since been allocated in a 2nd Phase (marked by a yellow diamond). The tenancy agreement is not a lease, but a licence to occupy. This is an important legal distinction – it is different from the Allotments, for example. They are bound by their own constitution, modelled on many other Allotments associations around the country. The main reason for this arrangement is to keep the historical integrity of the Camp. Not to block development – rather the opposite – but to do it in such a way that includes as many people as possible in realising their personal goals and being part of a community at the same time. the agreed value of works carried out by tenant are paid in lieu of rent. hut to be made wind and watertight, and the gable ends to be painted within first year. in the event that the tenant wishes to cease tenancy, and the value of works is greater than the rent due, there is no mechanism to compensate the licensee. The Trust has no funds available for repayment. For example if a tenant repaired and decorated a small hut, there would typically be no rent to pay for 5 years. After that, a further 3 years rental tenancy is guaranteed, assuming a successful completion of the agreed restoration work. value of works, which has been assessed by a Quantity Surveyor employed by Trust, should not, as a guide, exceed 5 times a theoretical annual rent. if no works have been started after 6 months the tenant will be given notice to quit. a maintenance schedule will be issued with an annual inspection. tenant meets the cost of planning and building warrant (only required if the tenant wishes to change the existing status). The huts selected for the scheme provide a range of building from small huts to the largest huts (some of which may be capable of being subdivided). Smaller huts 23, 24 and 25 can be sub divided internally into 4 individually locked areas. Prospective tenants are advised to consider what might happen when they decide to cease tenancy for whatever reason. CDT has no funds to reimburse refurbishment work except by providing free rent.